In 1939, ANSCO started as “Ando Iron Works” after World War 2, which engaged in processing and assembling machine tools. The founder, Hideo Ando, was a faithful, gentle and strict man of Meiji period. 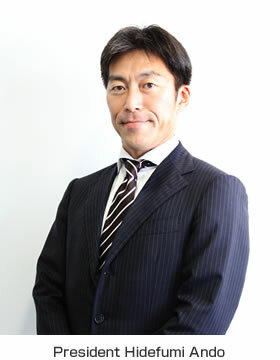 Hidetaka Ando, the frist son of Hideo, assisted in the family business since he was a high school student. He worked hard to support his large family. He has a story that is still repeated. In the summer when he was 18 years old, he walked for several kilometers carrying heavy iron material in a rear car by himself to be in time for a customer. He is a developer values the encounter with people, and always questioning. When he went to Europe on business trip introduced by his friend, he took an opportunity to start developing a high efficiency and automation screw manufacturing machine. He succeeded in developing it, and started selling original brand socket screws to meet demands in USA. In this way, the history of our company has been made based on the creed “Innovation and Harmony among people”. We will continue to keep the creed in our mind that is to work with our colleague shearing hardship and happiness, and to value the encounter with people. Furthermore, we have been learning and improving ourselves to be a global player and keep in step with the times to meet requests from our customers. We will never be satisfied with our present situation, never be overconfident in our technical skill and keep going forward. Please be excited about ANSCO’s actions from now on! Thank you again for visiting The ANSCO Co., Ltd., and please contact us to answer any of your questions or help you address any of your needs.